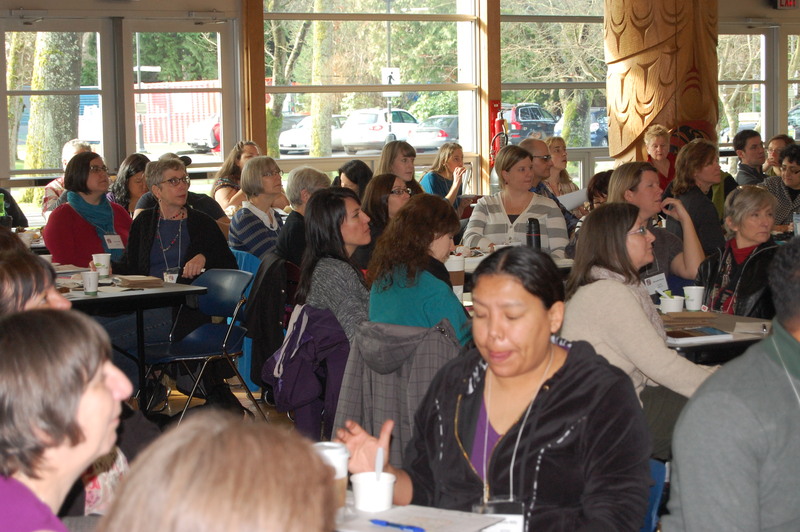 The 4 th Aboriginal Math Symposium was held Friday March 7, 2014 at the UBC First Nations Longhouse with over 180 people attending from across the province. This year’s theme of Mathematics, Weaving, Storywork and Drawing drew participants including educators, faculty members, administrators, students and community members from Port Hardy, Haida Gwaii, Kamloops, Lillooet, Sooke, Victoria, Chilliwack and the Lower Mainland and universities including University of the Fraser Valley, Vancouver Island University, Vancouver Community College, Douglas College, University of Victoria and UBC together to explore, share and imagine new possibilities for improving mathematics education for Aboriginal learners. 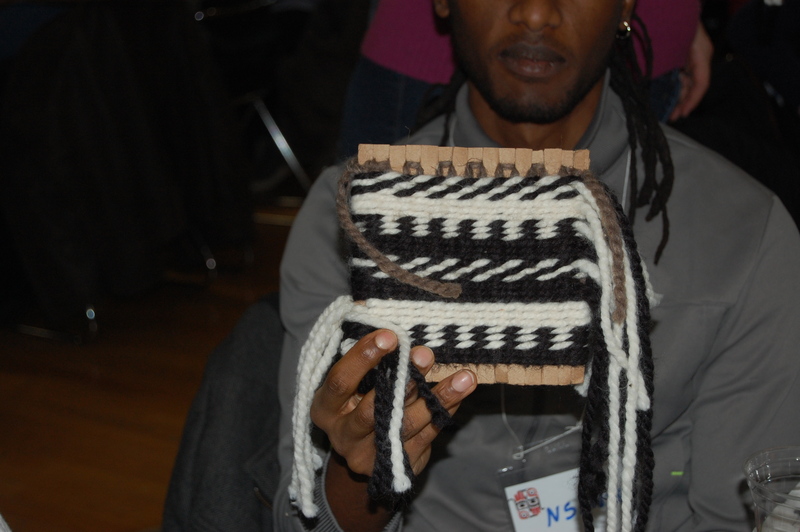 Participants investigated patterns through permutations with Dr. Shawn Desauliners, designed and wove their own wool quarter bags with Squamish Nation wool weaver Anjeanette Dawson, and explored proportion and patterns in First Nations West Coast art with Haida artist Billy Yovanovich. This very successful event was organized by Cynthia Nicol, Jo-ann Archibald and Melania Alvarez of UBC with support from the Indigenous Education Institute of Canada, Pacific Institute for the Mathematical Sciences (PIMS), the UBC Indigenous Teacher Education Program (NITEP), Department of Curriculum and Pedagogy, and Actuarial Foundation of Canada. This entry was posted in Uncategorized and tagged Aboriginal, Education, Math. Bookmark the permalink. I really enjoyed the session and am looking forward to continued work in Langley school district on helping educators create more success for aboriginal students. I was wondering where I could find the instructions on how to finish my quarter bag. I’ll have the weaving instructions and math problems up and available on this Network by Thursday March 13.